Enjoy piece of mind knowing your pet bird isn't tormented by Scaly Parakeet mites. Parakeet mites-->Easy detection and eradication of this skin deforming pest. These Parakeet Mites--also known as Scaly Leg and Face Mites--or Burrowing Mites--will start by getting under the skin and scales of your parakeet or canary's face...around the eyes and beak...then they'll move on down to the legs and feet. They'll set up shop and stay forever...living, breeding, and laying eggs under the scales of your birds skin. Always keep yourself on the alert and knowledgeable about symptoms you might see in your canary. Once they find a suitable home they start eating and laying eggs. This activity creates a build up of scales that can become quite an ugly deformity. Look for a dry scaly build up around the eyes and beak areas of the face and on feet and legs. These little scales can look like little spikes shooting out from the feet. Some bird owners have mistaken the scales for a fungus. Actually...what you're seeing is the residue left over from these parakeet mites. Photos from "Bird Diseases" by L. Arnell & I.F. Keymer. Published in 1975 on T.F.H. publications. It's rarely necessary to see a vet for this problem. If you have the right information, tools, and products you can treat many canary illnesses at home. Mite and Lice Sprays Have Shortcomings. Although mite and lice sprays can "help" kill these scaly parakeet mites, they're ONLY temporary and they DON'T work on mite eggs...Nor does a spray get into the small fissures of your canary's skin where the mites are...so...A lot of mites simply won't be affected and you'll have to spray weekly for several weeks in order to kill the young ones as they hatch out. Treating the Cage or Aviary. Spraying your canary's home with a mite and lice spray will kill any parakeet mites that are hiding in the cracks and crevices of his abode. SCATT is your best bet by far. It is for treating your bird NOT the cage. A drop of this product--which contains Moxidectin--is VERY effective at eradicating this nuisance and...totally safe for your bird. SCATT is VERY affordable. One bottle can literally last for years. None of the pet stores in my area carry SCATT. It is a relatively new product and is still difficult to find. However...it is sold online. Thank goodness for the internet. I LOVE IT! Your bird will be very unhappy. It works just as well on Air Sac Mites and Red Mites so you can kill "two birds with"...errr..."two mites with one stone"...so to speak. Actually, it's even better than that. As I mentioned Scatt works on several kinds of mites and also lice and fleas. click here now to go there. 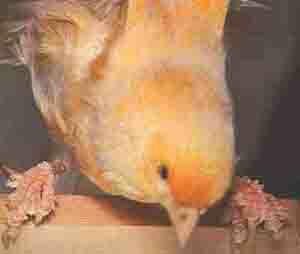 Return from Scaly Leg and Face Parakeet Mites to Canary Disease Main Page.